Chicago is a magical place. With its diverse shops and eateries, the clean streets and friendly people, Chicago seems to open its arms and welcome you like an old friend. Chicago is a place of great culture AND a lot of weekend construction projects! We left for Chicago at 6am Saturday morning. From our home in Michigan to the ‘windy city’ it’s a four hour drive (given good traffic) which left us plenty of time to get there. (Take into consideration there is a one hour time difference). The ride was smooth. It’s a fairly straight shot from our area to Chicago with I-94 being the greatest length of roadway to travel. We arrived in Chicago within that four hour time period. With Mapquest directions in hand and the availability of On-Star turn by turn navigation, we weaved through the busy Chicago Loop and found our exit that took us to the downtown area. Construction. Lot’s of it. Not only were they doing some street repairs, they were also blocking off streets to put up the holiday lights along State Street and Michigan Avenue better known as the “Miracle Mile.” We made it through the detours and found a place to park. Note: Public parking in Chicago is a nightmare! There are few parking structures or places on the street to park since most people take the train (Metro) into the city. Anyway…We found a structure to park for the day and we were on foot headed toward Macys! We arrived at Macy’s along the Washington Street entrance. There, we found the “anti-Macys” group protesting. For those of you that don’t know, Macy’s bought the former Marshall Fields store, which was a landmark in Chicago. There was a huge protest when Macy’s decided to change the name of this flagship store from Marshall Fields to Macy’s. The protesters were handing out flyers and buttons that proclaimed that there wasn’t room for Macy’s in Chicago. I guess everyone has to have a ‘cause’ to participate in; but I think there are greater issues one could devote time to! A line was already forming outside of the store at all the entrance points. 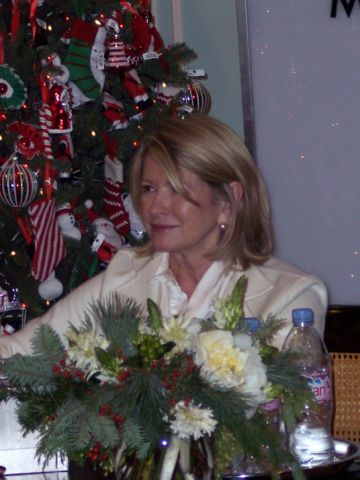 The buzz on the street: Martha Stewart. Martha was in town for the lighting of the great tree, a two story giant of a tree located on the 7th floor in the Walnut room. As I was standing there, I overheard a couple conversations about Martha signing ornaments following the tree lighting. No other details. I was thrilled! Within minutes, John, who is another huge Martha admirer sent me a text message (he was at the other entrance) that he heard the same thing… Martha would be signing ornaments. I was even more thrilled now! However, I didn’t have any details… I had to get the ‘scoop’ and get it fast! The minutes seemed to tick slowly by. When the store opened, it was a rush of people. Literally hundreds of people were rushing in the door at the same time, quickly fanning out into the store to their desired destination. Most were headed to the 7th floor to the Walnut Room. As I walked in the door, the first person I saw standing in the center aisle was Terry Lundgren, the CEO of Macy’s. I recognized him from his appearances on the Martha show. I stopped and introduced myself. He’s a very elegant man. He extended his hand, and shook my hand as I told him that I had been a Macy’s shopper for years and I was especially thrilled with the new exclusive offerings with the Martha Stewart Collection. He was very kind. He took a moment or two to talk and thanked me for being a loyal Macy’s shopper. It was a nice way to start my Macy’s day. But the crowds were running by me to get up to the Walnut Room! I had to get moving! I was walking so fast I was leaving poor David in the dust! I kept turning around to make sure he was coming along. He would smile, wave, and urge me to keep going! He knew how important this day was to me… I wanted and I needed to see Martha today! When we arrived on the 7th floor, the line was already stretching around the corner. We found our place in line and secured it. Members of the Macy’s staff were announcing that the Walnut Room would take the first 400 guests to attend the tree lighting. With David holding our place, I went off to scan the crowd and take a quick assessment. Would we be part of that 400? Indeed we would! We made it! Now, we just had to wait. A text message came through on my phone. “I have two ornaments and two wristbands” It was John. With a fury of text messages back and forth, we decided that we would meet in the signing line and he would slip a wristband off his wrist for me and give me an ornament to have Martha sign. HAPPY HAPPY HAPPY!!!! I was thrilled! As we were standing in line waiting to get into the Walnut Room, there was a flurry of activity. Security was everywhere. Martha staffers were running about with clipboards and cell phones keeping aisles open and elevators ready for Martha’s arrival into the Walnut Room. Martha Stewart Television crews were on hand to record the event. Producers were interviewing kids and adults alike as we waited. The excitement was mounting! It was much like watching a Presidential candidate make an appearance. “Advance” staff running around making sure that everything went smoothly. It was exciting to watch. 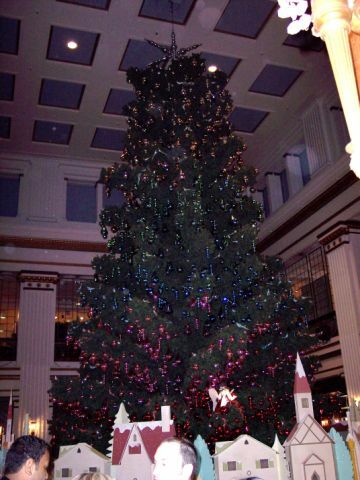 We were up to be seated in the Walnut Room and our seat was actually behind the tree and lighting stand. DRAT! But.. Where there is a will, there is a way.. I would eat lunch, and venture off with camera in hand. Lunch was wonderful. A delicious “Poinsetta” drink…cranberry and pomegranate juice with Champagne and a wonderful lunch of Chicken Pot Pie. There were other choices on the menu of course, but Chicken Pot Pie seemed to be quite “Martha” and seemed to be appropriate. It also reminded me of Claudine, who is another Martha admirer and loves Chicken Pot Pie! The room was so beautiful. Very elegant. There were great performances by local gospel groups and a local children’s choir. The anticipation was building and building quickly! We were soon to be moments away from the official tree lighting! We finished our lunch and had “Martha Stewart gingerbread pumpkin cake” with ice cream for dessert. I looked at David and told him I was off to see if I could get a couple pictures. The tree lighting was minutes away! The MC for the day announced the President of Macy’s North who introduced Martha and Terry Lundgren. Mayor Daily was also on hand to light the tree. When Martha came forth the crowd came alive! A thunderous round of applause for Martha, who looked stunning. She waved and said a few words about the Chicken Pot Pie that SHE just had. (See? I knew it was a great choice!) Members of the audience would yell out, “We love you Martha!” and she would turn, wave and smile in the direction of the admiring fan. It was wonderful! Television cameras were rolling and it was time to light the tree. Unfortunately I do not have a high powered digital camera. While it takes great pictures in the right lighting, it was difficult to capture the moments due to the dim room lighting. Photoshop came in handy as I tried to enhance the pictures a bit! 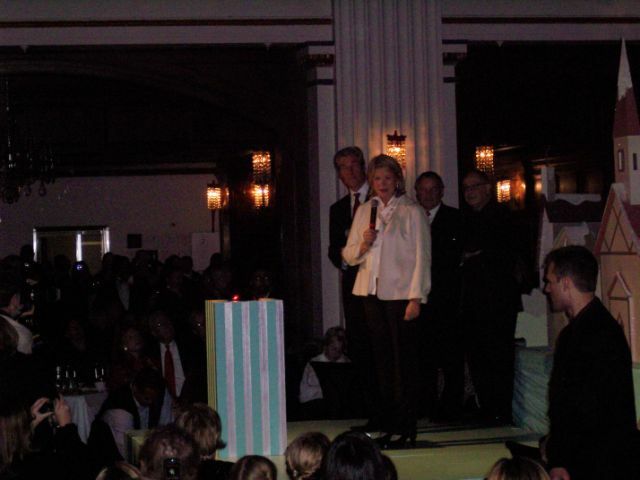 With a loud countdown of “5-4-3-2-1” Martha, Terry Lundgren, and Mayor Daily pushed the magic button and the tree came to life! The applause was incredible! It truly was the holiday season! This picture of the lit tree does not do it justice at all. It is a tree that you must see to appreciate. 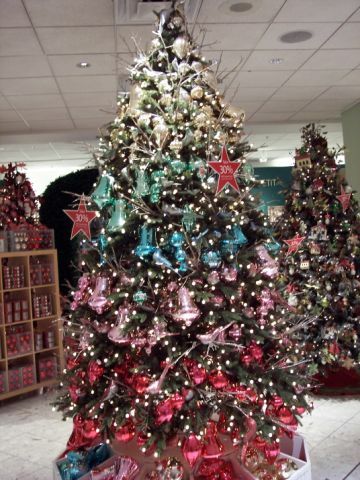 It was adorned with hundreds of Kugels and “great tree” ornaments. We were off to the races again to the ornament signing. I had to find John! The elevators were slow.. Very slow. So we took the escalators down to the first floor. The line was long .. We finally found John! We exchanged stories of the day so far and we tried to get one of his wristbands off. IT WASN’T BUDGING!!! There was no way to slip the band off his wrist so I could put it on. That was okay.. I figured I could go around to the other side and at least take a few pictures of Martha and enjoy the excitement of others. Just being able to be there and share in the day was fine with me. But a signed ornament would be a total bonus! We went around to the other side, through the wonderful Martha Stewart Gallery (it was incredible) and I wedged my way to the roped off section right at the signing table. There were a few people in front of me, so I raised my camera up and started snapping pictures. Slowly, people would move out of the way and I could get to the very front of the roped off area! I was just across the aisle from Martha! I was snapping pictures like crazy! I had positioned myself in the best “viewing” place! I watched as Martha greeted her guests and signed the ornaments. She was quite warm and friendly with each person that came through. Macy’s made sure that the people coming through the line had NOTHING but their ornaments for her to sign. No cameras, no memorabilia, nothing but the ornaments. This would speed along the signing. You could see the excitement on the faces of those that were in line. You could see people saying things to Martha and she would look up and smile and say, ‘thank you.’ Martha was so gracious to everyone. People were moving through at a good rate of speed! A few people were introduced to Martha by a person from Macy’s and Martha would shake their hand. At one point there was a lull in the action.. Someone in line had a camera which resulted in a halt in the process. I took a chance..“Martha!” I said in a voice loud enough for her to hear… she turned and I waved.. “why are you over there?” she asked me with a big smile. “You should be over here!” I told her I had missed my opportunity to get the ornament and wristband in time. “I hope you’re having a good time today” she said. I nodded and said, “I can’t think of a better way to kick off the holiday season” She flashed that wonderful smile again and said, “I’m glad you’re here!” A “Martha Moment” for sure! That brief exchange made the entire trip worth it! During this time, David was going through the gallery finding items that we haven not been able to find locally. I waved to him to come closer so he could see Martha. He too was thrilled to watch her. He commented that its strange to see her in person when he only sees her on TV. He said several times, “she’s beautiful.” And indeed she is a beautiful woman, inside and out! All in all it was a wonderful day. Once David removed me from the front of the ‘viewing’ line (I was being extremely selfish not wanting to move) We went to the various Martha boutiques throughout the store. They were everywhere! Thank you Macy’s and thank you Martha for making this a day to remember. Also, my love and thanks to my dear David for his patience, and to John for his sweet generosity. It could have only been better if Claudine, Bill, and Andrew could have been here! Nancy was with me. I felt her. I kept having this urge for a cocktail around 5.